Published in 2017 by University of South Dakota professor Patrick M. Garry, The False Promise of Big Government is a pleasantly short text intended to present its readers, perhaps for the first time, with the foundational cases against statism and the ever-swelling Administrative State in America. 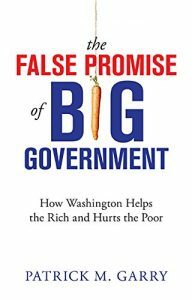 Sure to incite the wrath of statists, the book bludgeons centralization and state power by taking six promises of big, bloated government to task. Aside from its accessibility and clarity, The False Promise of Big Government is notable for developing the argument against ever-expanding government beyond its two typical pillars: “cost and constitutionality.” Although Garry grapples with big government’s cost by critiquing the “entitlement state,” President Franklin Delano Roosevelt, and the social-welfare polices promoted and implemented in the late twentieth century, and its constitutionality by critiquing a swollen administrative state, Garry goes beyond these two familiar (and tired) arguments by organizing his book around six essential points. First, Garry asserts that “big government caters to big power,” and this is because “Big government is all about monopoly.” Drawing from examples ranging from the Dodd-Frank Act to the Affordable Care Act, commonly known as Obamacare, Garry argues that big government hurts the mom-and-pop shop, favoring instead an avaricious and evil caricature of the big-bad businessman bent on buying politicians. Such a characterization oversimplifies the matrix of state and market apparatuses through which we move, but given the polemical, pamphleteer style in which this slim book was written, the move is understandable. Garry’s second point is that big government “breeds cronyism.” Summed up in the fatigued phrase “crony capitalism,” “government’s favoritism toward the politically connected” is a well-established issue behind which both Democrats and Republicans rally. This leads to Garry’s third point, that ever-growing government is increasingly a tool of the elite. Beginning with the Progressive movement of the late 1800s and early 1900s, Garry argues that big government gives rise to a “status culture” rather than a “growth culture that empowers upward mobility for the common person.” This is evident in areas ranging from ridiculous licensing laws to increasing economic inequality engendered by cronyism. Fourth is the observation that “big government becomes its own end”—bureaucratization begets bureaucratization. Traced through the Great Society programs of the 1960s to the VA scandals of the recent past, Garry contends that government addresses its problems with a circular solution: “more government programs and spending.” Fifth, and all too frequently on display in the United States, is the observation that “big government backfires,” one example being how politicians have attempted to make higher education more affordable. Calling for additional federal funding to lower the cost of a college education in America, politicians ignore that fact that “tuitions have soared largely because federal money is so readily available” [emphasis in original]. Garry concludes with the increasingly evident point that government kills civil society. The swelling of American government has coincided with a decline in nongovernmental institutions, the most important of which include “the family, school, religious organizations, civic groups, neighborhood associations,” and the increasing self-importance of government as the central institution in society. Correlation does not equal causation; many other explanatory factors contribute to the seemingly inverse relationship between civil society and government, which may be why Garry makes a short argument—by far the shortest in the book—for the sixth point. These arguments against big government and its claimed goods are not new. Writers from centuries past like Adam Smith and Fredric Bastiat, along with more contemporary thinkers like Ludwig von Mises, Milton Friedman, Murray Rothbard, Robert Nozick, Henry Hazlitt, and F. A. Hayek, figure prominently in pleas against the expansion of state power. Indeed, Smith and Bastiat still stand as unsullied, towering figures, and their ideas continue to inform modern thinkers like Garry by providing a foundation for attacks on big government. Garry shouts from upon these giants’ shoulders. Hopefully the rest of us—whether in Washington, D.C., or Tacoma, Washington—are wise enough to listen.